Did you know there was a Briton queen who caused the occupying Romans fits in the middle of the first century? If you have ever visited the Embankment in London near Westminster Bridge, you may have seen a statue of a woman warrior riding in a chariot. This is a representation of the Celtic Queen Boudica who laid waste to three cities in Britain and decimated one legion along with its infantry before succumbing to a more organized army of Romans in one dramatic ending to her rebellion. The story of Boudica is told by two Roman writers, Tacitus and Cassius Dio who wrote much later. Tacitus would have had a first-hand account of the events from his father-in-law, Gnaeus Julius Agricola who served as governor of Britain c. AD 78-84. Of course these accounts were written by the eventual winners of the conflict and the Celtics had no written records. Consequently, Boudica’s story is shrouded in mystery and told with a Roman slant. But we do have enough historical and archaeological information to piece together what happened during the rebellion. In 43 AD, Emperor Claudius made a full scale invasion of Britain, this being the second since that of Julius Caesar. Only Claudius’ invasion led to a four hundred year occupation. It is noted that Claudius received the surrender of eleven kings of Britain. One of these kingdoms may have been the Iceni, a tribe that occupied what today constitutes Norfolk, eastern Cambridgeshire and northern Suffolk. The Iceni paid tribute to Rome and supplied a quota of troops. But in AD 47, according to Roman law, the Iceni were divested of their weapons by the governor of Britain. The Iceni were particularly incensed by this treatment. After all, they had submitted to the Romans without a fight and having no arms left them vulnerable. The Iceni and other Celtic tribes to the south rose up in a rebellion which was not successful. But in the end, the Iceni were essentially able to remain a client-kingdom of Rome. It was about this time the leader Prasutagus emerges as king of the Iceni. By the time of his appearance he was already married to a woman named Boudica. Tacitus tells us Boudica was royally born. We don’t really know if this woman’s actual name was Boudica. Her name is spelled in various ways: Boudica, Boudicca, Voadicia, Bunduca and Boadicea. The spelling of Boudica is in keeping with various Celtic words for “victory”, particularly the Old Welsh “bouda”. So it could be claimed that Boudica was the first Queen Victoria in Britain. Boudica is described by Dio as being tall and having long red hair that hung to her waist with a fierce facial expression and a harsh voice. Based on the dates given in the evidence, she was probably in her early to mid-thirties and possibly as old as forty at the time of the rebellion. She also had two daughters. Tacitus tells us Prasutagus was renowned for his wealth and archaeological discoveries of eleven hoards of gold and silver torcs, ingots, bracelets, and coins at Snettisham, Norfolk dating from this era attest there was great treasure and affluence in the area. Dio describes Boudica as always wearing a large gold necklace, presumably a torc. Prasutagus died c. AD 59 and in his will he named his two daughters as the heirs to the kingdom with Boudica to act as their regent. Also, in a vain hope for a peaceful transference of his wealth and lands and to safeguard the future of his family, he named the Emperor Nero as his co-heir. This wasn’t an unusual procedure at the time. But things didn’t turn out as Prasutagus had planned. Agents of the financial administrator of the British province seized Prasutagus’ lands and wealth. Some of the Iceni nobility were mistreated and suffered a humiliating change in status. Boudica was publicly flogged and her daughters were raped. This wasn’t all. Certain sums of money had been given to primary Briton leaders by the Roman Emperor Claudius and these were believed to be gifts. However, the same financial governor who had taken Prasutagus’ wealth now declared these sums were indeed loans and began to demand repayment. Another example of Roman exploitation of the native population is exemplified in the city of Colchester (Camulodunum) to the south of the Iceni in the lands of the Trinovantes Celtic tribe. Colchester had been founded as a “colonia” by the Romans. Retired Roman soldiers were given lands in the area to settle. These soldiers seized lands from the natives, driving them away and calling them slaves and prisoners. The Romans took more land than they were allotted and kept the Trinovantes in deplorable conditions, using them as labor for their constructions projects. One of the biggest new buildings in Colchester was a temple dedicated to the Emperor Claudius. This was particularly galling to the natives, because they didn’t worship in this manner and because they had to pay for and build the temple. When Boudica began to gather troops for her rebellion, the Trinovantes were ready to join her. The Roman writers say Boudica gave a speech to incite her supporters. This was standard procedure for historians to write about at the time so we don’t really know if she did this or not but it is clear she was driven to rebellion. Her troops headed to Colchester. Colchester itself had no walls. The only defensive position for citizens of the city was the precinct of the Claudian temple which was under construction. A Roman legion with some cavalry came south to try to rescue Colchester. The legion was ambushed and destroyed. They may have lost as many as two thousand men. The “colonia” was completely wiped out in the first rush by the rebels. There was a two day siege of the temple which had been barricaded by some of the citizens and they finally surrendered. Then the entire city was burned to the ground and all remaining citizens, including women and children were killed by either hanging, crucifixion, blade or fire. Archaeologists have found a layer of reddish-brown ash consisting of burnt wattle-and-daub, molten glass, broken tile and blackened pottery. This layer is called the “Boudiccan destruction horizon”. It’s a clear indication of the violence and devastation of Boudica’s attack. In the meantime, the governor of the province, Paulinus Suetonius, was occupied in the west fighting the Silures and supressing the Druids on the island of Mona, now called Anglesey in Wales when he received word of the attack on Colchester. Boudica was headed to London (Londinium) and Suetonius gathered his troops to make the march toward the same target. He made good time and arrived shortly before the Britons. Suetonius may have considered using London as a military stronghold. But London was not the bustling metropolis that it is today. And, like Colchester, it was not fortified. Suetonius read the situation correctly, realizing he had inferior numbers to the rebels and decided to abandon London. Those citizens who could left the city for safety, leaving behind those who were unable or unwilling to depart to face the destruction. The Britons destroyed the city just as they had Colchester. There was a great conflagration, the inhabitants were slaughtered and the town was plundered for loot. Archaeological evidence from digs starting in 1915 exposed a red layer about thirteen feet down and nearly sixteen inches deep. There are fragments of blackened roofing tiles and burned coins from the reign of Emperor Claudius, scorched grain and pottery. London deteriorated into a state of decay and was clearly abandoned for some time. Boudica turned her attention to St. Albans (Verulamium), another undefended town. St. Albans was different in that it was a Briton town, populated by Celts who were friendly to Rome. Suetonius didn’t come to the defense of St. Albans. He was working on making sure the entire province didn’t fall into the Briton’s hands. The inhabitants of St. Albans had advance warning of the destruction of Colchester and London enabling them to escape and take some of their personal belongings with them. Boudica’s troops were able to plunder and loot what was left. Once again there is a red layer, evidence of the incineration of the town. Suetonius was in a tenuous position as he called for and awaited reinforcements. He moved away from London into the Midlands. He knew he was greatly outnumbered by the Britons and it’s fairly clear he sought the greatest advantage for ending the rebellion, namely the time and the place for a conclusive battle. Unfortunately, Tacitus and Dio don’t name the location of the battle but Tacitus gives great detail about the terrain. The Romans chose a defile (narrow gorge) with woods behind them. This allowed them to look down upon open country allowing them to face only what was in front of them. Boudica drew up her forces on the plain facing the Roman legions. Behind them was a line of supply wagons. Women and children, families of the fighters, sat among the wagons to watch the battle. The Britons charged first toward the professional and highly trained Roman fighters. At first the Romans held their ground. Word finally came for the assault to start. The Romans advanced in a wedge formation, using a deluge of javelins with deadly effect. This was followed by a methodical and orderly assault by the Romans. Wholesale slaughter of the Britons was the result. The Britons were pushed back toward their wagons. The Romans killed the troops as well as their families, including the women and children. Tacitus reports that eighty thousand Britons were killed and only four hundred Romans lost their life. Whatever the true numbers, it was a definitive victory for Suetonius and his legions. Boudica apparently did not die on the battlefield but managed to escape. Tacitus says she died by poison and Dio claims she fell ill and died. It seems clear she took her own life. We do not know the fate of her daughters but it is unlikely she would have left them to be slaughtered by the Romans. Boudica was given an expensive and magnificent burial. Unfortunately, we don’t know the location of her grave. Some Britons continued to fight. With the help of reinforcements from Germany, Roman vengeance was swift and terrible. All those who took part in the rebellion were hunted down and killed. Even those who were sympathetic to the rebels were lost. The Britons had neglected to plant their crops to participate in the rebellion in the hopes of seizing Roman supplies. Many of the agricultural workers were lost in the battle or wounded. Consequently, famine among the natives resulted. The Iceni were driven from their lands and the land was laid to waste. The people that were left were driven to slavery and transportation. Boudica nearly brought down the Roman government of Britain with an overwhelming number of fighters and the irresistible element of surprise. But due to the astuteness of Suetonius and his superior fighting forces, the occupied territory of Britain was saved and managed to be governed by the Roman Emperor until the Roman troops’ abrupt withdrawal in the fifth century. 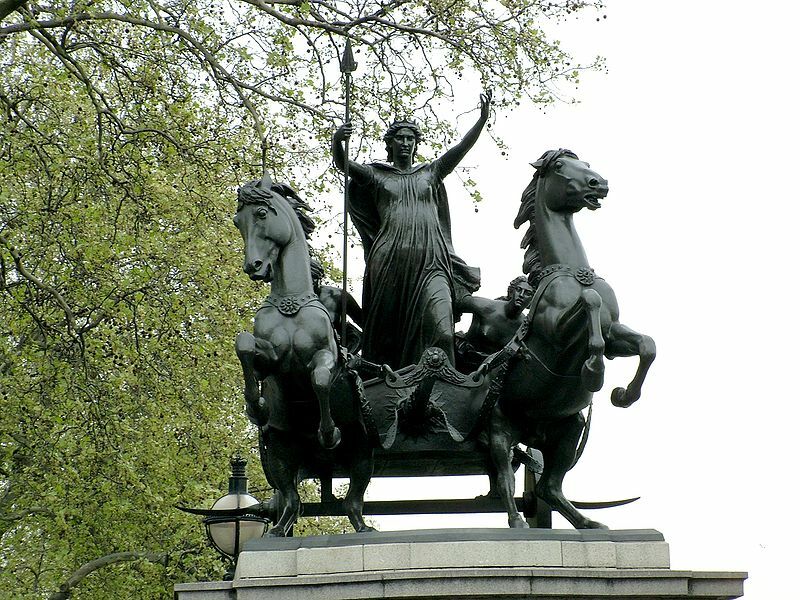 From the sixteenth century onwards, Boudica would become a charismatic subject for poets, artists and writers and she remains a symbol of national patriotism to this day as the statue on the Embankment attests.